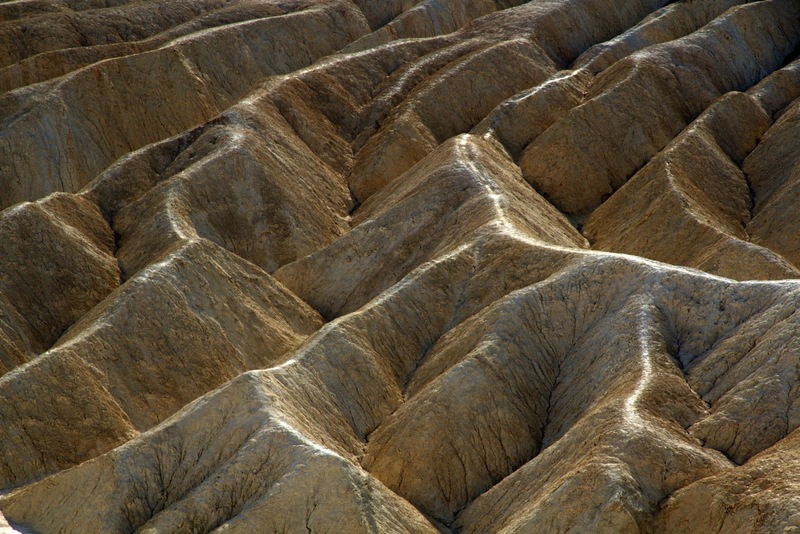 DEATH VALLEY…. IT’S NOT ABOUT THE FOOD! Leaving Las Vegas we head out across the desert to DeathValley. 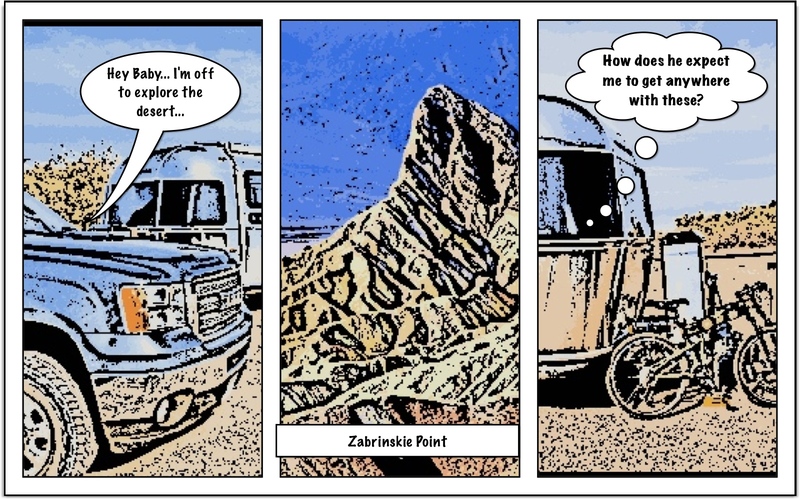 We stay two weeks at the Furnace Creek Ranch RV Park. This is a full hook-up park that is filled with the full time and seasonal workers in the park and a few spaces for the general public. We are parked next to an ancient trailer who’s resident seems to be a collector of the discarded. It gives the place a trailer trash shantytown feel, but not in a bad way. After two weeks, we want to stay longer and move about a mile down the road to the NPS campground at Furnace Creek. Here we have water and sewer, but the park service is waiting on Washington to give them the price with electric… so we rely on our solar panels and generator for power. 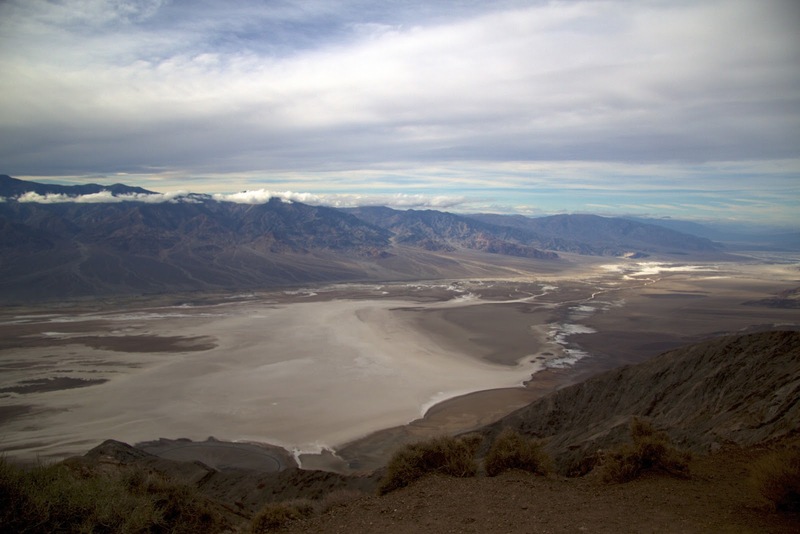 But we are not here for the food… we are here for the breathtaking scenery and the magic that is Death Valley. 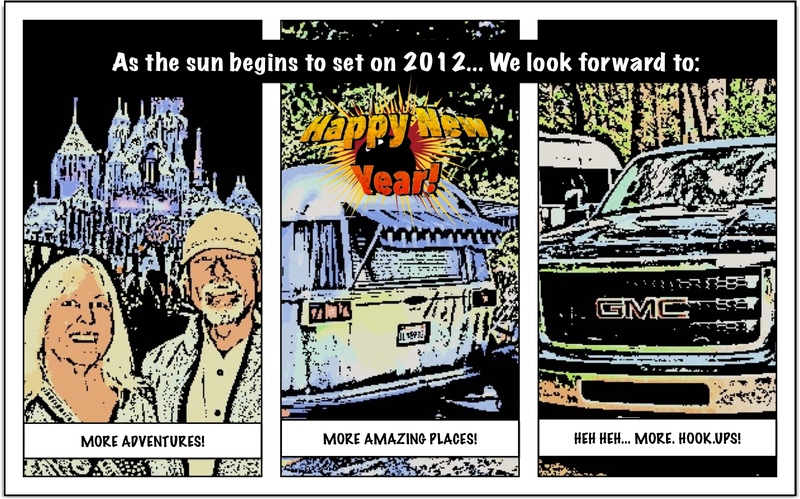 We were here four years ago and discovered the joys of exploring and driving on the unpaved roads. Then we ventured out in our BMW X5, which is not really the best choice for any serious off road adventures. BUT NOW we have Dave with his new beefy tires and the gravel and dirt roads call to us. 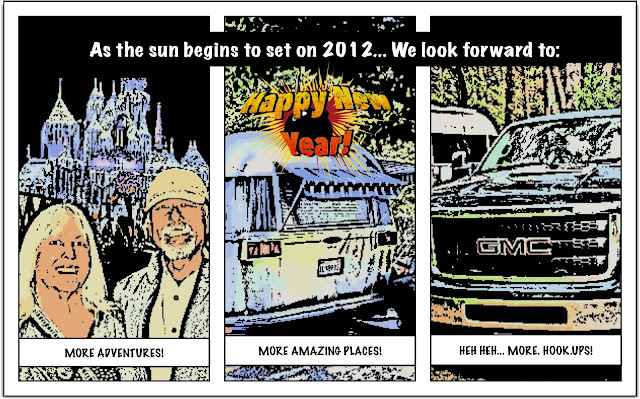 Heading out on the West Side Road, we explore the side roads and eventually end up at the Queen of Sheba Mine. 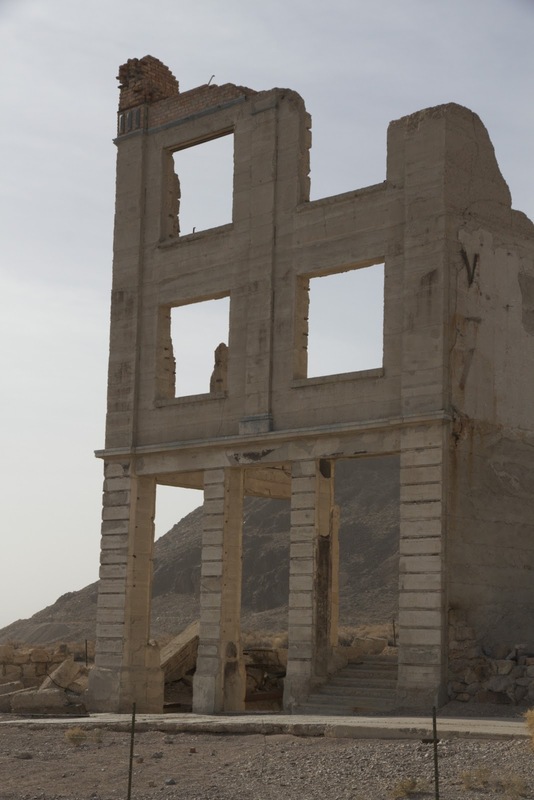 Aware of the dangers, we carefully explore the abandoned buildings and peer into the blocked mine shaft and think about the people who came to this desolate basin searching for wealth and adventure. We visit Bad Water and take in a ranger talk on the area. The extremely salty Bad Water Pond is home to a small water snail and pickle weed and not much else. The salt flats beyond are decorated with beautiful polygon shapes. We also attend another ranger talk up at Dante’s View, which is directly above Bad Water. Here we have a bird’s eye view of the entire basin: one hundred miles to the north, eighty miles to the south and twenty miles across. Stunning! We tour the historic Furnace Creek Inn. (We styed here four years ago and it is fun to learn more about the history of the inn. We hike up Golden Canyon on a ranger-guided tour and learn about the geology of the area. After, we continue up the canyon to the Red Cathedral and up into the badlands behind Zabrinskie point. We drive the road through the Artist’s Palette a couple of times and soak up the colors of the hills. One of our favorite spots in the park is the Race Track Playa. Before heading out we check the road condition and are warned by the rangers that the road was damaged in the last flash flood, it is extremely wash-boarded and it can cost thousands of dollars to have your vehicle towed if we were to break down out there. Armed with this knowledge we head out and discover that the road is really, really bad but nothing that Dave can’t handle. 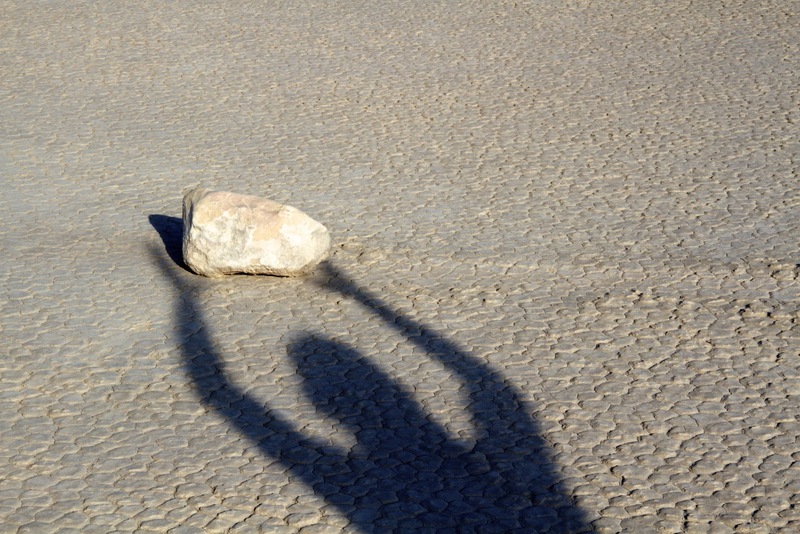 We are rewarded with perfect winter lighting to photograph the mysterious moving rocks of the Racetrack. After the road to the Racetrack, all of the other unpaved roads in the park are a piece of cake! 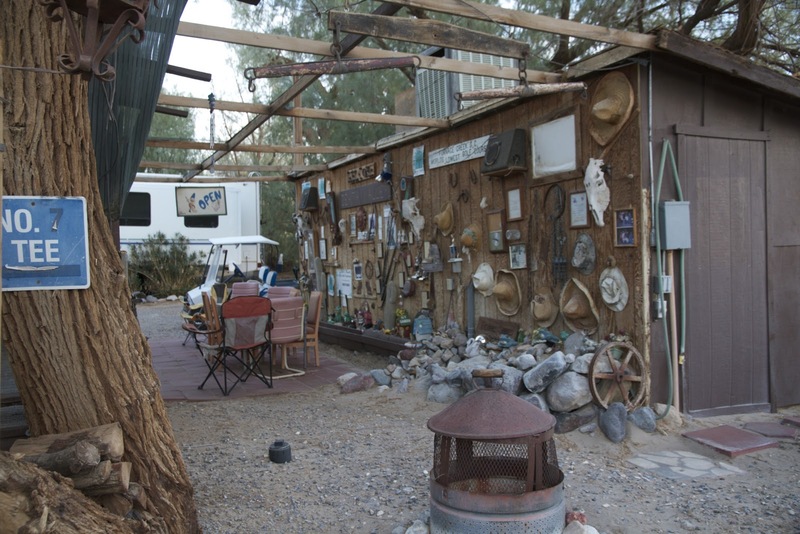 We drive up to Beatty, NV to pick up a few groceries and return via the one way unpaved road through Titus Canyon. 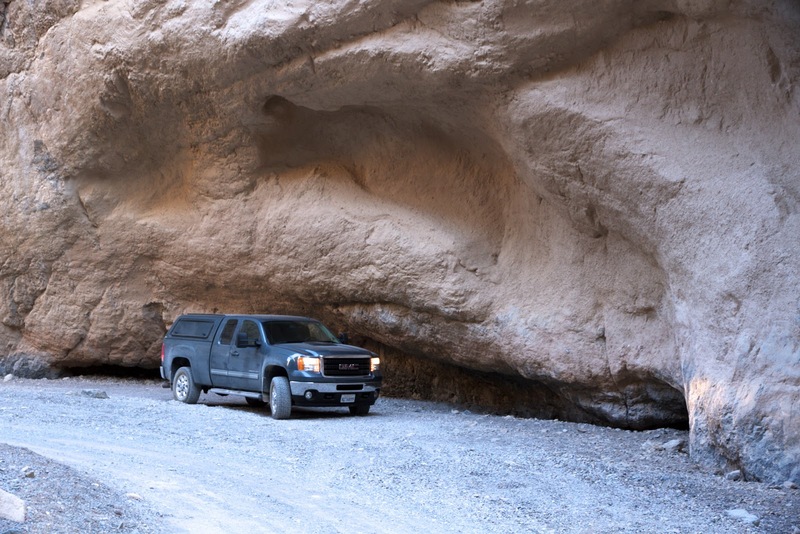 Along the way, we explore the ghost towns of Rhyolite and Leadfield see some ancient petroglyphs and marvel at the layered colors of the canyon walls. Another day we explore the back roads up to and around Greenwater. 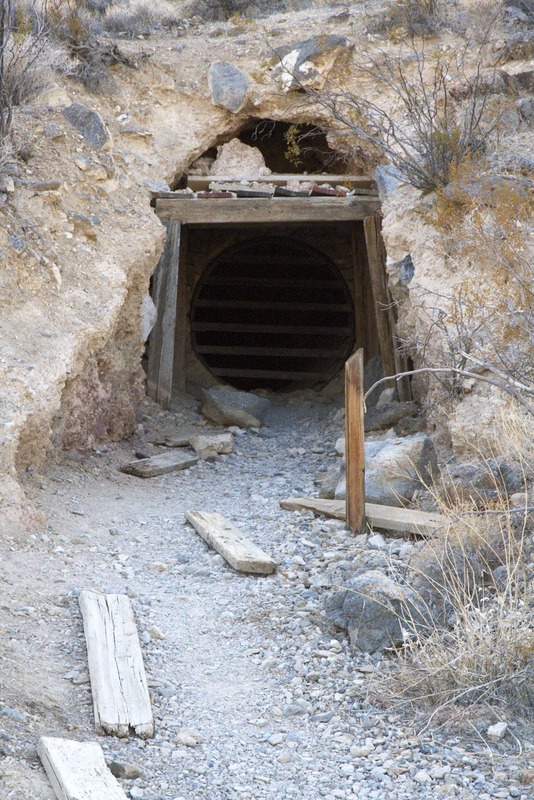 Greenwater was a copper mine that lured investors and miners based on a small amount of high grade copper from a test hole. Unfortunately this was the only copper and the mine went bust and investors left with huge losses. Some say that this was the first domino to fall in the crash of the great depression and all that remains is scattered rusting cans and a pile of early twentieth century trash. Visiting Ghost Towns is a really great excuse to use 4WD so we spend another day up and around Skidoo (as in 23 Skidoo.) More abandoned mines and piles of rusty debris. The hike up Mosaic Canyon is an adventure in rock scrambling as we make our way to the final dry waterfall at the end. We stop at Salt Creek and walk the boardwalks looking for pupfish that remain hidden. Up at Scotty’s Castle, we take two guided tours. 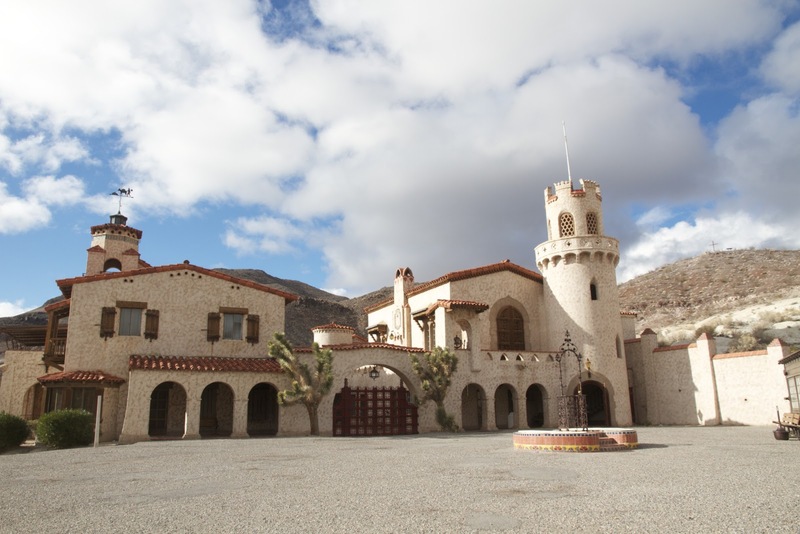 First of the wonderful Spanish style villa and a second underground tour of the water and power systems that supplied this millionaire’s vacation home in the desert with the modern conveniences of indoor plumbing and air conditioning in the early twentieth century. During our third week it snows in the higher elevations and the surrounding mountains are dusted with white. 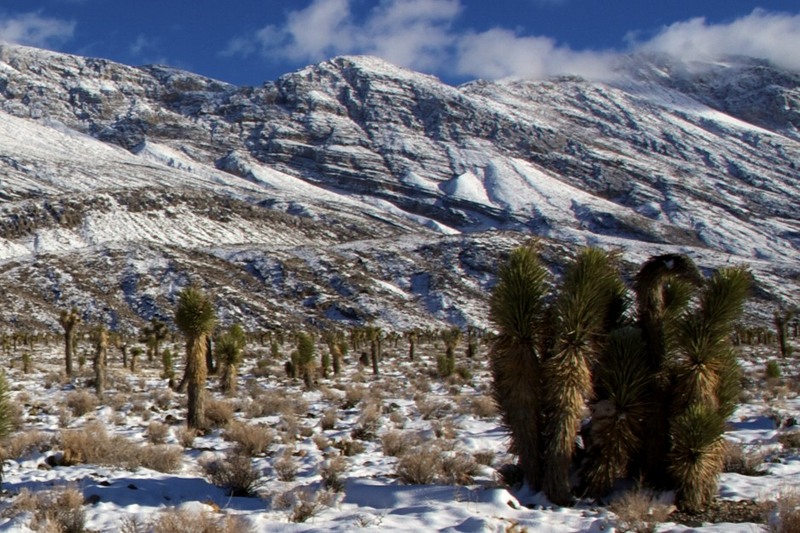 We hear that the road to the Racetrack has been graded so we head out and are treated to Yucca’s in the snow. We also head up to Beatty to refuel since diesel is $2.00 per gallon cheaper than in the park and return again via Titus Canyon. With the holidaze rapidly approaching, we reluctantly leave this magical desert experience and head to southern CA to spend some time with our families before heading off once more, into the sunset. IT’S THE END OF THE WORLD… AND WE’RE GOING TO DISNEYLAND! We wish everyone a wonderful holiday season!